CK One Summer 2009 (above left) ~ this year's summer limited edition of CK One, inspired by "an unencumbered summer day at the pool", will launch in March. The notes features blue mint, cucumber, limette, bergamot, water accord, green apple, rosemary, lotus blossom, rum cocktail, sandalwood, driftwood and sea moss. 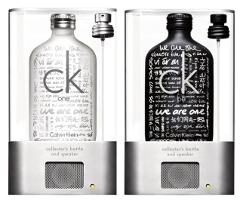 CK One Summer 2009 will be available in 100 ml Eau de Toilette. (via cosmoty.de) See also: CK One Electric 2006, CK One Summer 2007, CK One Summer 2008. I've loved every ck One Summer release. I expect no less from this one! That's a cute bottle too! Hope you'll love it then! I could do without the green apple & aquatic accord myself but the rum cocktail part sounds nice. I was fed up with the CkOne, and I like the CKbe, but both smell a litlle too much like the 90's to me. With this I mean it is still too close, perhaps I'll revisit them in a couple more years. I haven't cared for the Summer releases neither, BUT I LOOOOVED the Ck One Electric, that came out a couple of years ago. I figured that it would be easy to come by later on… and there you go… I cannot find it anymore! I really like the written bottles. They would make very nice presents!! LOL — seriously, I love to smell CK One again. Yes, it's the smell of the 90s, absolutely! But I don't smell it all that often so that's fun for me. I got my son some CK one for Christmas which he has been out of for a few years–his reply, “This was supposed to help me get chicks, damn it”. I don't think it's a gift — they're charging 59 euros IIRC? And speaker components are not that expensive. Ohhhh, the black one is CK One be! I read it too fast. I've fallen in love with CK One :). I'm going to get it when I get the Deluxe L.P. hopefully they have the CK sumer one also. Sounds interesting. Is the new summer one unisex also, Robin? ?